Composed by Colin Brumby. 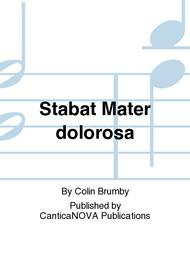 Text: Sequence Hymn - Stabat Mater dolorosa. Accessible Lenten motet. Lent, Stations of the Cross. Octavo. Published by CanticaNOVA Publications (C5.5137). 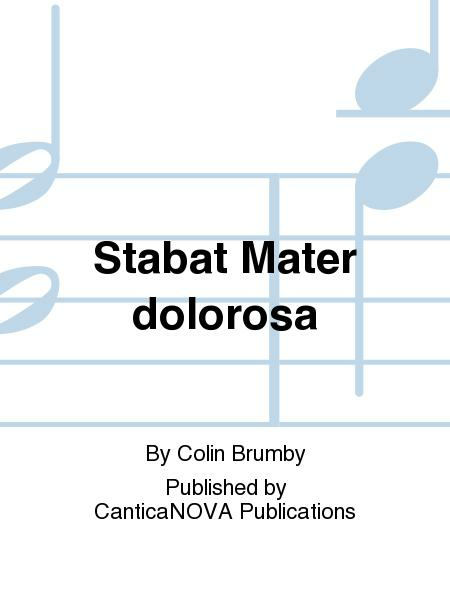 The Stabat Mater dolorosa, for the Memorial of Our Lady of Sorrows (September 15), is one of the four liturgical sequences retained in the Lectionary. The others are the sequence for Easter, Pentecost (A or B) and Corpus Christi. Dr. Colin Brumby has set the opening stanza of the sequence for SATB choir and organ. A string quartet or ensemble could also play the accompaniment. In the key of d minor, the two sections of the work contrast in texture: the first, is strictly homophonic; the second introduces some polyphony. The flavor of Mozart's choral works pervades this piece. The extremely comfortable ranges (Soprano: D to D; Alto: Bb to B; Tenor: D to E; Bass: G to Bb) and the tunefulness of the choral lines make this a very accessible piece for any church choir.